Leader of the NAZI party. 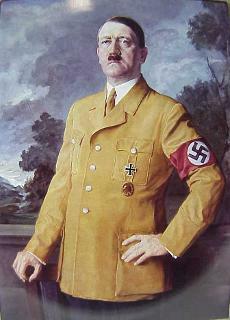 Hitler had been claiming that Hanisch was cheating him out of the price of his paintings. It lead to a head when Hitler complained to the police and Hanisch was arrested and sentenced to seven days in prison. Hanisch was sentenced on the 11th. Kurt Eisner was shot in the back by the German nationalist Anton Arco-Valley. Hitler attended the funeral. Initially put in the group as a military counter-intelligence officer to keep tabs on the group Hitler decided he liked the ideas of the group and became a leader with in the party after his discharge from the military. Found guilty Hitler was sentenced to three months imprisonment, but judge George Neithardt stepped in and got the sentence reduced to one month and probation. Neithardt was the judge to preside over Hitler in the Beer Hall Putsch case. Destruction of files related to this case was top priority when the Nazis first came to power. Hitler seeing that the prosecutor and the Judge were sympathetic to his cause used the trial to voice his propaganda. His opening speech was over 4 hours, and the judge George Neithardt allowed Hitler to interrupt the proceedings as he saw fit. The prosecutor even praised Hitler often through out the trial. Hitler was sent to Landsberg prison to serve his five year sentence along with Rudolf Hess. The two worked on Hitler’s book Mein Kampf meaning My Struggle/War. The prison had comfortable quarters, and many of the guard’s were fans of his trial and his ideas. Hitler under the request of large industry supporters expelled Otto Strasser from the Nazi Party. Gregor his brother that had similar ideas in regards to socialism as Otto stayed with the party. In a meeting arranged by Goering, Hitler gets to preach his party line to top banker Hjalmar Schacht, and German Industrialist Fritz Thyssen. Both became major financial backers of the Nazi party. Being born in Austria, Hitler was not a German Citizen. In order to run for office he naturalized. Winston Churchill interested in Hitler because of him trying to run against a World War I hero for office and doing a good job at it sought to meet with Hitler. Even though Hitler was at the same hotel he refused to see him stating he was unshaven. Historian Paul Maracin thinks this was an inferiority complex on Hitler’s part. Paul von Hindenburg beets Hitler by nearly six million votes. In a seeming act of jealousy Hitler kicks Gregor Strasser out of the Nazi Party. Strasser was offered a cabinet position (something that would normally be given to the party leader i.e. Hitler) by then chancellor von Schleicher. This was an intentional move by the chancellor to destabilize the Nazi Party. Hitler leader of the Nazi Party, Joachim von Ribbentrop a wine importer, and Colonel Oskar von Hindenburg the son of the then president of Germany Paul von Hindenburg meet secretly at von Ribbentrop’s house for unknown reasons. Eight days later Hitler was appointed Chancellor of the Reich. Even though he had only been voted into office for several months the German parliament met in an opera house and voted for the “The Law for Alleviating the Distress of People and Reich”. Even though the Nazi party did not have the 2/3rds majority to pass the bill Hitler had already used his military force the SS and SA to round up a majority of the communist and social democrat opposition in response to the Reichstag fire. The people that he had not rounded up were either in hiding, or voted for the bill under the duress of being thrown into jail. The measure passed 441 to 84. Hitler approved a proposition by Göbbels to start a boycott against the German Jews in-response to the Madison Square Garden anti-Nazi boycott / protest to happen later that day. In protest of Hitler’s anti Jewish protest Foreign Minister von Neurath resigns. In response Hitler says that if von Neurath can get statements from the United States, Britain, and Foreign Jewish groups that the atrocity charges against Germany were lies, and to call off the Jewish led anti-German boycotts he would call off the Nazi Boycotts scheduled to start the next day. Von Neurath took the charge and got the desired statements from both countries and some of the large Jewish groups apposed to the boycott. When von Neurath presented this to Hitler he still declined to stop the anti-Jew boycott. Hitler receives a final call from von Hindenburg requesting that he calls off the anti-Jewish boycott. Hitler finally agrees to call off the boycott seeing that the Nazi party is still young and boycotts focused on Germany would destroy the party. Instead of totally stopping the boycott he declared them “paused” for five days to see if the anti-German boycott will stop, and if at such time it has he will totally abandon his anti-Jewish counter boycott. This turned out to be only words because the SA brown-shirts went on with a violent boycott despite what Hitler said, and even coupled it with vandalism and assaults. After the anti-Nazi boycott had started Schacht met with von Neurath and Hitler to talk about the dire situation. For a remedy Schacht purposes that the Reichsbank freeze accounts of foreigners and emigrants. This frozen money would be used to pay reparations while the owners would only be able to spend their money in Germany. According to Mooney they discussed Hitler’s “New Deal”, re-industrializing Germany and getting Germans into cars. May Day is the occult druidic holiday that just 11 years later Hitler would kill him self and have his guards burn his body. In the early morning SA leader Ernst Rohm was arrested by Hitler as part of Operation Hummingbird. Hitler had told Rohm to arrange a gathering of the top SA members for a dinner that night, but instead Hitler showed up early that morning while they were still in their hotel beds and arrested them. Schneidhuber the Munich Chief of Police was taken into custody where Hitler told him he was a traitor and removed his rank. Around 10am Hitler arrives at the SA headquarters the Brown House. Now that Hitler had rounded up the heads of the SA that could rally the underlings of the group against Hitler he made a call to Göbbels to announce the go ahead to begin murdering the rest of the people on the Nazi’s hit list. After the take over of Sudetenland of Czechoslovakia he promised to a large group of of gathered people in Berlin “this is my last territorial demand” - which was a lie. Angry about the deportation of his family out of Germany back to Poland Grynszpan shot vom Rath who died of his wounds two days later. When vom Rath died Göbbels politicized his death, and with Hitler’s approval unleashed the Nazi SA upon the German Jew population in a pogrom known as Kristallnacht or the ’Night of Broken Glass’. Under threats of war and bombings the Czech government lays down to the Nazis and surrender the government. Drexler became perturbed with Hitler after he lied about his history with the early German Worker’s Party. Hitler stated that he had joined the party when it first started, and that he was the seventh member to join. In actuality he joined nine months after it’s inception, and was the five hundredth and fifty fifth person to join. Knowing that the Russian army was not long from apprehending the couple Eva Braun (Hitlers newly-wed wife) took cyanide capsules, while Hitler shot him self in the head. Supposedly by Hitler’s request their bodies were taken out of his below ground bunker, doused with gasoline and burned. We must learn not to say: "Never! Better death than dishonor." We must learn to submit to law, even when imposed by aliens whom we hate and despise, and whom we believe to be blind to all considerations of righteousness.